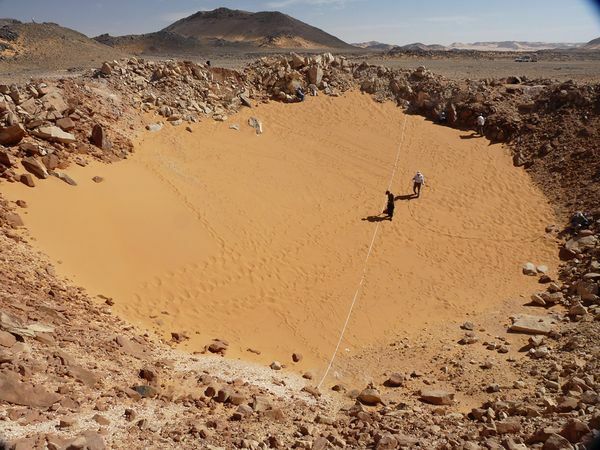 Discovered (Vincenzo de Michele) in 2008 using Google Earth satellite imagery Kamil Crater was confirmed as a definitive meteorite impact crater in southwestern Egypt. About 147 feet wide and 52 feet deep it was produced by an iron meteorite estimated to be only about 4 feet wide and weighting between 11,000 and 22,000 lbs. Over 1000lbs of meteorite fragments have been collected at the site in the past couple of years. Another view of the crater showing the jagged rocks around the edges showing that they were broken up quickly and tossed randomly to the side. This crater is being studied because it helps geologists and astrophysicists to understand what to expect from small meteorite impacts. Computer simulations of similar impacts that were performed before this crater was discovered can now be tested against real data from this site. The age of this crater has not been determined but based on the amount of sand deposited in it and some minor erosion of the rock it is thought to have been created possibly within the past 5000 years. So this is a very young crater compared to something like the famous crater in Arizona which is much larger but also exhibits much more erosion. But youth here still probably means several thousands years making the crater in Arizona appear to be far far older. In earlier posts I have explored at some length the various views about craters on Mars and the arguments made that they may be the result of creation with the appearance of age. In this case young earth creationists would not use apparent age to explain this or the crater in Arizona because they are found embedded in the very rocks that they propose were formed by a global flood. Thus these craters must be post-flood features and therefore must be on the order of only a few thousand years old. What can Kamil Crater tell us about the origin of craters not only on Earth but also on other Planets? And what does this tell us about the age of the Earth and those other planets? As I discussed before, some young earth creationists when faced with craters on Mars and the Moon want to say that these planets where created to look like they had been impacted by meteorites and thus were created with the appearance of age. Others, like Walter Brown want to explain all craters in the context of a universe which is less than 10,000 years old and were formed by “natural” means. For example, we looked at how Walter Brown explains craters on Mars and the Moon as the result of rocks thrown off of the earth during the breaking up of the fountains of the deep at the onset of a global flood. So rocks from earth end up impacting Mars sometime after the flood and thus all the craters were formed in the last 4000 years. 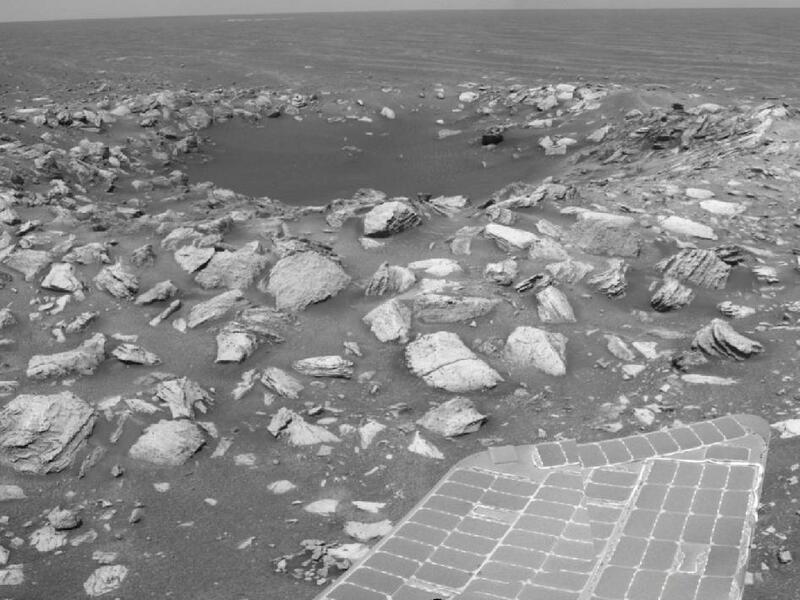 Endurance crater as seen from the Opportunity Rover on Mars. Notice the very smooth edges of the crater. There are no sharp edges to any rocks and the bottom of the crater has partially filled with very fine sand. Endurance is more than twice the width of Kamil Crater in Egypt. Endurance is thought to be at least hundreds of millions of years old. Imagine a crater that looks like Kamil but then having wind wear the rocks down to completely flat surfaces over time. Kamil crater is a crater that is 1/3 the width of the Endurance crater (pictured above) that the Opportunity rover visited in the first year roving on Mars. The latter crater is thought to be hundreds of millions of years old while Kamil is thought to only be thousands and the differences in their appearance are great. The material ejected from Endurance has completely eroded leaving a completely smooth edge and walls to the crater. In the case of Kamil crater the rocks are jagged and large rocks are found strewn all over the grounds some of them hundreds of meters away from the impact center. 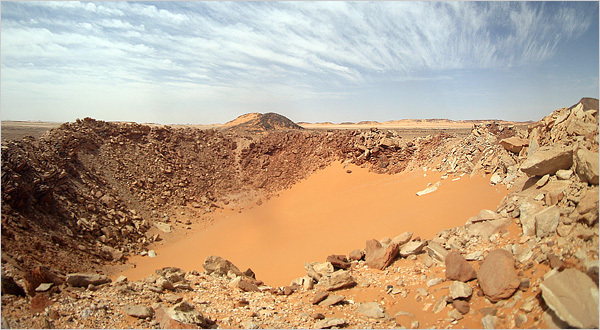 In the case of this crater on earth, it has been subjected to wind storms and rain albeit not much rain but rain each year nonetheless. What has caused the erosion of the craters on Mars. Wind erosion is the primary force (there are also cosmic rays, the sunlight itself changing the molecular structure of the rocks etc.. but these are very minor forces and would require millions of years to make any noticeable changes) available to wear down the rocks there and the amount of wind is far less than on earth and because the air is so thin. As a result fewer sand particles that could be used as abrasive material would be in that wind thus erosion rates in wind on Mars are expected to be far less than on earth. On earth one expects craters to erode and fill quickly while on Mars erosion takes place at a much slower pace. If Mars is the same age as the earth and these craters were formed rather than having been created with the appearance of age by God directly one would expect all the craters on mars to all appear something like Kamil or even younger. But are there fresh craters on Mars? 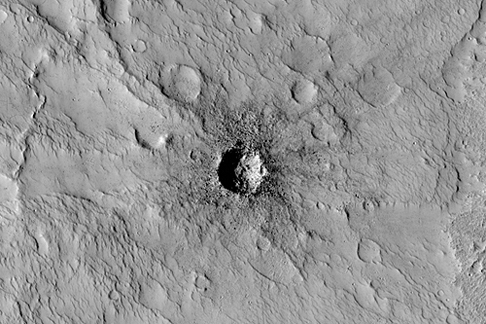 There are certainly craters that appear more like Kamil crater and thus attest to more recent events on Mars. For example the above small crater is obviously younger than the Endurance crater. The presence of uprooted rocks that are not completely eroded attest to a history of much less age but even this crater is thought to be at least 100,000 years old with wind causing the breakdown of the rocks to the point that they are seen today. There are even newer craters than these. In fact there are a few that have been shown to have formed in the past 5 years. Between satellite captures in 2005 and 2010 several new spots appeared and so represent very recent meteorite impacts. Another “young” crater on Mars. Notice the dark debris that has been strewn over the lighter “older” material. The last picture is of a satellite image of a “young” crater on Mars. You can see dark material around it which represents material (large car-sized boulders) that have been ejected and landed around the crater. But also notice that there are circular objects which appear to the be the remains of much older craters that have completely filled with material and eroded to to the point that only a small lip representing the edge of the crater is still visible. A common theme in apparent age arguments is that God created with the appearance of some “general” age but generally a resistance toward a specific set of observable historical events. For example, on Mars there are craters that are formed in sedimentary rocks which themselves have an apparent history, those craters have younger craters inside them and even those younger craters have smaller younger craters in them which themselves have eroded to some extent. All of this suggests a very specific series of historical events that require vast quantities of time. This has caused many people, most notably and recently Rev. Al Mohler, to proclaim that God created with apparent age but even Mohler is likely to balk at all of these craters being created with apparent age since they can be read so clearly as a series of events spaced out over time. Really this is true for any object but without thinking too much about this many have found it easy to suggest that light was created with age and that the planets in general were created with apparent age. 1) All craters are actually less than 10,000 years. The assumption is that craters are blemishes on a good creation and thus must have originated after the fall. Craters on the earth obviously originated after a global flood and thus are very young. Craters on the moon probably also occurred during the flood year since meteorite impact on earth is often an explanation for the mechanism of how the flood started. 2) Craters on the Moon and Mars are all created by God during the first 6 days and thus have the appearance of age. Craters on the earth that appear to be older than 10,000 years were also created with the appearance of age. Some allowance for a few real history craters are allowed. 3) Some craters were created with appearance of age but many were caused by normal providential impacts. On Mars most craters were created with the appearance of great age (see last pictures with craters that are almost completely eroded) but after creation some continued crater formation has occurred. How one can determine what geological features are part of “real” history versus “apparent” history is problematic since apparent history would build in real history making us think it is real. All of these have serious shortcomings mostly because each attempts to solve a problem (like obvious successions of crater age on Mars) but ends up creating even more problems and requires that many pieces of evidence must be ignored to maintain a particular view. Craters on Mars may seem so distant and so it may be easy to ignore their existence or meaning but the Kamil crater and others on Earth are a testimony in the rocks of the Earth’s history and should not be ignored. Any time spent investigating these craters should give any Christian reason to question the veracity of young earth creationists attempts to ignore or explain away these features of the world around us. I do not see any evidence why these cannot be young craters. They look young to me. We don’t even know the past atmosphere on mars yet they foolishly make the claim its at least 100,000 years old? Anyone think this structure is going to last 100k years if the atmosphere is more like venus, jupiter, or even earth? Apparently ancient histories record mars going to war against the other planets. Big collisions would create many chunks of debris which then would be attracted back to the planet causing lots of craters at once. The lack of craters in that mars picture if anything indicates a young planet. I don’t believe anyone can use the number of craters to determine age anyway because we have no idea how much debris the solar system has run into. They may look young to you but that doesn’t make them young. There is lots of evidence they are not young and no evidence that they are young. In fact I’m not sure by what criteria you have even decided they look young. There is a lot of evidence from several fields of study that all point to a great age. I have reviewed some of that on this blog. Again, you can believe anything you want about the use of craters but your believe doesn’t hold much weight without some form of evidence.Its more of a hope than it is for any good reason. How did the Earth escape all this debris or do you think that happened on the first day of creation.